At Sunland Welding, Inc. we take pride in having complete satisfaction from our customers. Established in 1996, Sunland Welding, Inc. has built a customer base through hard work, dedication and customer service. We have the experience and equipment to satisfy any welding or steel fabrication need, in our shop or in the field. Our qualifications range from creating cell tower modifications, platforms, custom truck beds & trailers, bbq’s, yard art as well as decorative gates and shades. 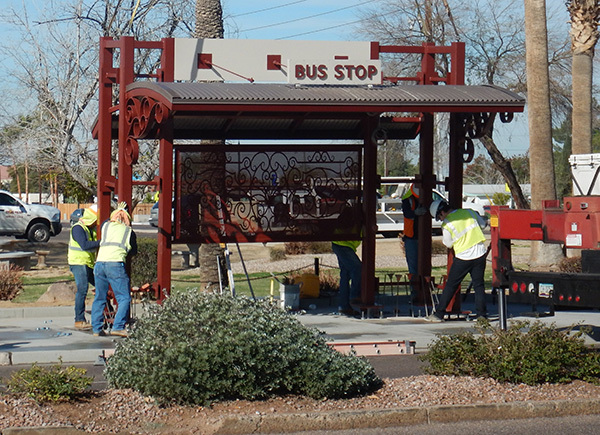 Sunland Welding worked closely with the City of Gilbert to complete their new custom designed bus stops in the Heritage District. Our team is passionate about delivering the results that our customers have come to expect from Sunland Welding. We’ve put together a creative and masterful team that is prepared to take on projects both large and small. Chris is the owner of Sunland Welding. He served a millwright apprenticeship and has background in construction, fabrication, welding, and machinery setting. Chris has been in business for over 25 years and in that time has built lasting relationships with our clients and a foundation for quality and satisfaction. Justin is the Field coordinator for Sunland Welding. He has grown up in this industry and has extensive training and knowledge in welding, fabrication and specifically tower modifications. He handles the daily ins-and-outs of the company and is helping to ensure that the reputation Sunland Welding has built will be carried out for years to come. Joe Hammer is the leader of our estimating team. He has been with the company for many years and has a vast knowledge of the steel industry. He’s worked on projects ranging from gates and small shrouds up to full tower modification and large custom entry gates. Jacob runs the Sunland welding fabrication shop. He has experience in welding inspections, quality control, and various welding techniques. He handles material ordering, production control and quality, ensuring each project meets their deadlines and maintains Sunland Welding’s and industry standards. We are constantly evolving and adapting to meet our customer’s needs. We know that we have to continually train our employees to ensure that our customers are receiving industry standard level quality – every time.